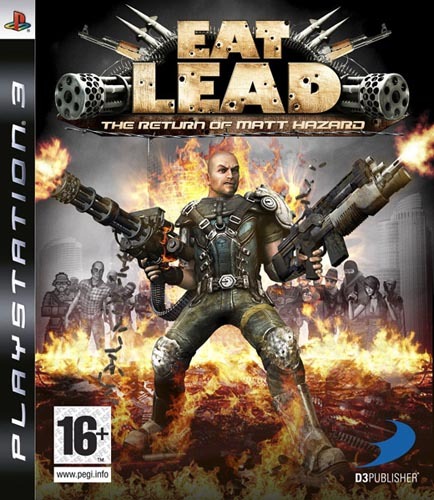 Eat Lead: The Return of Matt Hazard is a 3rd Person shooter, much like Uncharted or Socom but plays into the gaming stereotypes, internet memes, and ongoing industry jokes *cough* Duke Nukem *cough* that we all know and love. If you beat Crushing on Uncharted or Veteran on Call of Duty: World at War, you can conquer this pretty easily. If not, just be patient, use cover, and aim for headshots. Its a short game and has a total of 8 levels. TIP: You can use the trick of Uncharted where you can hide behind a wall, don’t use the cover system, and use the angles and views to position yourself so that you can’t get shot but can aim at the enemy. Even if your gun is pointing towards a wall, if the crosshairs are red you can hit them. Very handy as the enemy AI likes to stay still if they can’t see you making it very easy for headshots. All the difficulty trophies stack and using the cheat code to unlock Maximum Hazard DOES NOT block any trophies. I had no problem getting any and got my Platinum with no hitch. I would recommend that you don’t actively trophy hunt and just be concerned with finishing the game as you can clean up the remaining trophies using chapter select on an easier difficulty after. You’ll likely unlock some by accident (2 headshots 1 bullet for me) or through regular play (i.e. 100 headshots or weapon kill trophies). It might take a little longer because you have to play the level to go to the best area to farm kills or what have you but you can take more damage hits and be more aggressive in your style of play. As mentioned earlier, be patient and don’t be afraid to back track. Once the enemy is dead, they won’t respawn so if you’re feeling a little overwhelmed with gun fire fall back, regenerate your health, pick up ammo, and let the enemy come to you. In terms of guns, always try and the keep water pistol with you. It’s as strong as any other gun (one headshot kills) but its also very good against water soldiers who show up often throughout the game. It would take 2-3 headshots for any other pistol but only 1 from the water pistol. The plasma rifle is also very good with charged one hit kill shots with the addition of doing some splash damage to nearby enemies. Also get your hands on the energy pistol for its accurate blind fire. I usually use the Hazard Pistol, Energy Pistol, Water Pistol, and Plasma Rifle. The other guns, I usually ditch. Now that you cleared the game and gotten all the difficulty trophies out of the way now you can concentrate on the ones you missed. You likely still have locked the Observe the Grenade, Dances With Guns, Bedlam Basher, and Just a Flesh Wound trophies which is much more easily attainable on Minor Hazard. Just use the Select Map option, choose the appropriate level, then choose the Minor Hazard (easy) difficulty. This trophy will pop once you start your first new game. Once you beat the game and the credits begin, you’ll get this trophy. This one is earned in the middle of Level 1. This one is earned at the end of Level 1. This one is earned at the end of Level 2. This one is earned at the end of Level 3. This one is earned at the end of Level 4. This one is earned at the end of Level 5. This one is earned at the end of Level 6. This one is earned after defeating Altos Tratus in Level 6. This one is earned at the end of Level 7. This one is earned at the end of Level 8. This one is earned after the game. When you do the tutorial, make sure you kill the first enemy using melee combat. 1. Injure an enemy with gun fire and then make the killing blow a melee attack. 2. Pick up a Hazard Pickup and all your melee attacks will be one hit kills. I did this on Level 2 in the same room that I detail the “Bedlam Basher” trophy. There is a pickup in the room and a good number of enemies to get the needed 10 kills. I recommend doing this during the tutorial. Simply only attack enemies in the tutorial with melee until the trophy pops. See “Head of the Class” trophy. This should be earned fairly quickly. You should be aiming for headshots 99% of the time anyway. You won’t get this handgun until Level 2. You should get this without any issue by the end of the game. Level 2 I believe is the earliest you’ll get your hands on a shotgun. You can farm the kills on this level or keep playing the game and you’ll more than likely unlock it. The sub-machinegun appears in multiple levels. In Level 4, these guns are all over the place. Easily gotten in this level if you still need it by then. The AK-47 first appears in Level 2. You can farm this trophy then or keep playing. You’ll have several chances to get this. I recommend getting this one in Level 3. You’ll have 3 instances where you’ll be providing cover sniper fire. One the max difficulty, I had to replay the first scene a few times so it gave me plenty of time to get 50 kills. The Bandits (cowboys) in Level 2 can carry these. I would advise to just use these until you get the 50 kills and then go back to another weapon. They aren’t bad, but the second shot is many times inaccurate. You’ll start to encounter the Energy Pistol in Level 5. You should be able to get 50 kills by the end of the game. If not, farm them. You’ll see the Plasma Rifle in Level 5 as well. Same as with the pistols, farm them or just play through the game. When behind cover, aim at enemies and press (R2). Do not aim with (L2) as you do this. Simply get 25 kills and you’ll have the trophy. You could farm this, however I found myself using blind fire a lot throughout the game. The easiest place to do this is in Level 1. You’ll come around a right hand corner and see 3 fire extinguishers in front of you, along with one enemy. Basically you want the enemy to get close to the fire extinguisher closest to you. Then just get close enough that the explosion will hit you and shoot it. It should kill him while just hurting you. You can also use the grenade launcher and shoot a grenade at an enemy while you are close. You’ll encounter these on Level 4. I played on the max difficulty first, so only the magnum at that point would do one shot kills. You can farm this or find a shotgun and use that. It doesn’t have to be a headshot; just as long as the shot kills the zombie in one hit. Get “Better Than One” trophy in this same area. You can get this anywhere, however, there is a spot that you can consistently get this trophy: Level 4 during the first time to the tennis court. Get rid of the guys with guns first. Now it should just be a handful of zombies. Using a magnum, aim and strafe until you get 2 zombies to line up and get the headshots. Trophy should unlock easily. You must kill all the enemies that initially attack you at the beginning of Level 2 with headshots. It took a few tries on max difficulty, but still easily obtainable even on that setting. Just take your time and take good shots. Generally speaking, you can get the trophy by shooting a bandit in the legs making him stumble, try and race around behind him and melee him before he can turn back around. There is a better strategy and position however. The spot is in Level 2. You’ll enter a hallway with 2 enemies and a bunch of black boxes/speakers. Before entering the next room, just look in first. Straight ahead of you will be a small fenced in area at the back of the room. That is the spot you’re aiming for toward the end of this scenario. Enter the room and head to the left. A bandit will spawn in this fenced off area. I used a shotgun to dispatch him in one shot. Another will spawn to your right, so take him out. Now 2 enemies will bust through the door on the right side of the room. Once 1 of those are dead, another bandit will spawn on the same side of the room as the door they came from. Take him out. Hopefully you’ve left 1 regular enemy alive. Now head for that fenced off area at the back of the room. You want to face back toward the doorway that you enter through. Now kill the last enemy. A bandit will spawn in front of you facing away. Quickly try to melee him from behind. With any luck, you’ll get the trophy. After trying multiple spots for this, I was able to get the trophy on my first try with this strategy. Do this on the lowest difficulty. The best place I’ve seen is the room right before the final boss. You’ll come off an elevator and find a bookshelf in front of you in the room. If you exit the elevator and hide behind the right wall, you can look left and see a hazard pickup. Peek around over your left shoulder and take out the non-pink enemies. I had a red and yellow if I remember right. Anyway, at this point I had 2 pink testers to the right. I grabbed the hazard pickup and stood on the left side of the book shelf. The rightmost tester made it’s way left and formed a line of 3 testers. I aimed at the middle one and got the trophy. Be careful not to kill the last enemy because if you do you can’t go back. You can also do it during the final boss fight. During phase 3 of the final fight, all that will spawn are testers. It should be possible to get them to group close enough for the trophy. I never tried the final boss on the minimum difficulty so I can’t confirm if it’s easy or not. There is no way I could do it this way on Maximum Hazard. Press start at any point during the game. At the start of the game you will be asked if you want to go through the tutorial. Accept that and at the end you will earn this trophy. There are potted plants in the first room you appear in on Level 2. Once you’ve eliminated the enemies, simply shoot all the pots. Just be sure that each pot is actually hit. There are a total of 10+ pots so you will need to die or restart until the trophy unlocks. I’d recommend farming this one as it doesn’t take long. Do this in the same spot that I outlined in the “No Pain, No Gain” trophy. There are around 5 extinguishers total in the room. Run around and blow them all up, get killed, and repeat until you have 30. If you shoot an object and it “phases out,” it can be destroyed. Most crates, barrels, etc. that you can use as cover can be destroyed. When they are totally destroyed, a blue light appears where the object used to be. Destroy 20 of these for this trophy. Blow up any explosive objects you come across in the game. If you still don’t have this trophy by Level 7, there is a large warehouse that has a ton of explosives that you can use to get it. I actually farmed this one on accident while trying different strategies for the “Bedlam Basher” trophy. Just get 20 of these pickups to unlock the trophy. These are much more rare than the hazard pickups. The best place to farm these is on Level 6. There are at least 2 in close range of each other. There is also one on Level 4 while you’re escaping, however I’m not sure if the checkpoint is right before it or not. I do believe though that farming level 4 at this one spot may be the quickest method. The meat is in the second room on Level 2. There are several racks of meat hanging from the ceiling. Once the enemies are taken care of, shoot all of the meat. There should be two chunks that fall off of each piece of meat. Do this for each one and the trophy will unlock. This area is in Level 2. You’ll know it when there are robot dancers all over 2 different rooms on the ground floor. I could not get this one while playing through on the max difficulty. The enemies simply had too good of aim and ended up destroying 1 or more in the process. I’d advise to do this on the easiest setting. Make sure you are not in the line of sight of an enemy that puts one of the robots in danger. Also, remember you have to complete BOTH encounters, not just the first. Best chance for this trophy is on the easiest difficulty setting and on Level 1. No real tricks, just be patient, aim carefully, and use cover. Hopefully if you beat the game on the hardest setting, this should not be too hard of a trophy to earn. Beat the game on the easiest difficulty setting – “Minor Hazard.” This trophy can be earned by beating the game on any higher setting as well. Beat the game on the middle setting – “Major Hazard.” This trophy can be earned by beating the game on any higher setting as well. Beat the game on the hardest setting – “Maximum Hazard.” This is unlocked by beating the game once or by using the code at the beginning of this guide. If beaten on Maximum Hazard, all other difficulty trophies will unlock. On the main menu, click on Credits and let it run through. You could also beat the game and let the credits run through. Earn all bronze, silver and gold trophies in the game.